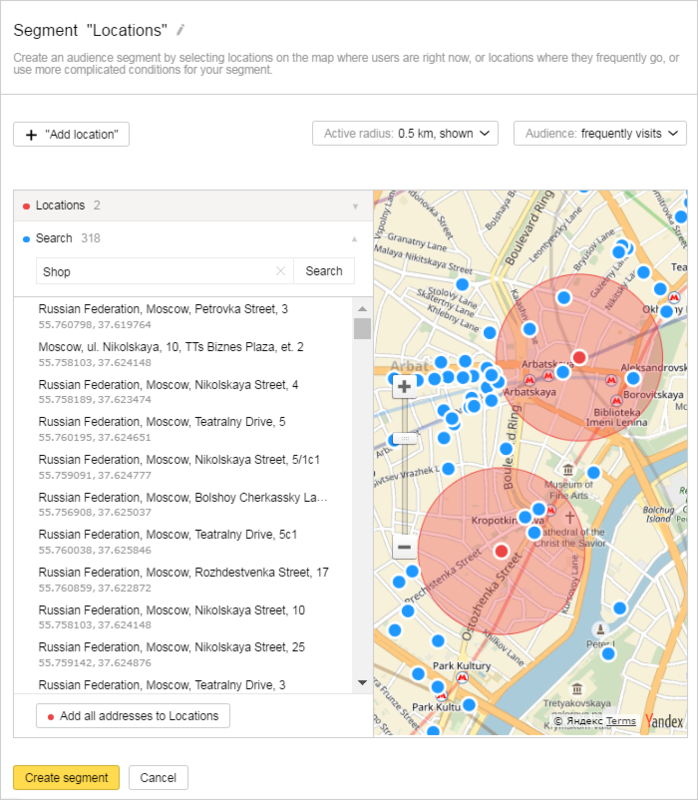 You can create a segment based on data about users in specific locations. In the Segments tab, click Create segment → Locations. Choose the type of location: circles or polygons. Specify a name for the segment. Search for locations or mark them on the map, and then add them to your segment. You can search for locations by name, address, or geographic coordinates. Enter the coordinates without the degree symbol °, primes, or additional letters, for example: 55.755831,37.617673. The search will cover only the visible area of the map. After the location marker is added to the segment, it turns red, and the row with the location's address or coordinates goes to the block Locations. You can add up to 1,000 locations (up to 100 for the condition Audience: visited N days within the period). 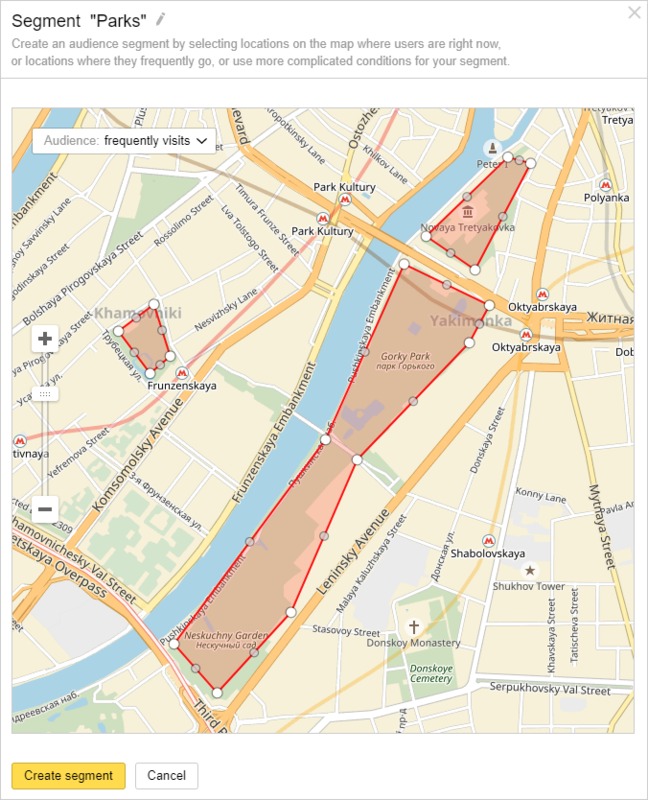 To remove a location, click on its marker on the map. The marker will turn blue, and the row with the location's address or coordinates will disappear from the block Locations. Enter manually or copy the list of necessary addresses or geographic coordinates, one location per string. Click the button Add to locations. If no or more than one location have been found for a row, the row will be ignored when adding locations. You can add up to 1,000 locations (up to 100 for the condition Audience: N days within the period). All the locations you have added to this segment before will be lost when you add a list. To remove a location, click in the row. Increase The Radius of Reach if you are interested in the surrounding areas rather than the locations themselves. You can choose a radius from 0.5 km to 10 km. You can change the radius of reach and the necessary frequency of visits to the selected area at any time, before or after adding locations. Audience: frequently visits, lives or works — The segment will include the cookies of users who regularly spend time, live, or work in the selected area. Targeting is based on the data from the past 45 days. Ads will be shown to users selected for the segment regardless of their current location. Audience: visited N days within the period — the segment will include anonimous IDs of users who meet the requirement. For example, the users who have visited the selected locations for 10 days within the last month. You can choose a period of a week, a month, or three months. Several visits in one day count as one. Ads will be shown to users selected for the segment regardless of their current location. Audience: currently located — the segment will include anonymous IDs of users who are currently located in the selected area. Ads will be served to users who are located in the specified locations. Mark at least three points on the map to create a polygon. Each new point will be connected to the previous straight line, forming a side. Sides of a polygon cannot overlap, and their area cannot exceed 10 km2. To finish drawing a polygon, click on any point and then click Finish. To add new points, click on a point where you want start drawing, and click Continue. You can remove a point by double clicking on it. As a result, the two nearest points will form a side. Finished polygons can be moved around the map. You cannot add more than 10 polygons to a segment. Audience: visited N days within the period — the segment will include anonimous IDs of users who meet the requirement. For example, the users who have visited the selected locations for 10 days within the last month. You can choose a period of a week, a month, or three months. Several visits in one day will count as one. Ads will be shown to users selected for the segment regardless of their current location. The segment you create will be assigned the “Processing” status. Processing can take up to two hours. If the audience coverage is at least 1,000 anonymous IDs, the segment gets the “Finished” status. You can now use it to configure your ads.